We’ve been covering passing the closed guard this week as our topic of Jiu Jitsu focus for the month is Guard Passing. There are both clear and annotated photos with arrows showing the direction of force, leverage and movement next to the description and location of each detail. 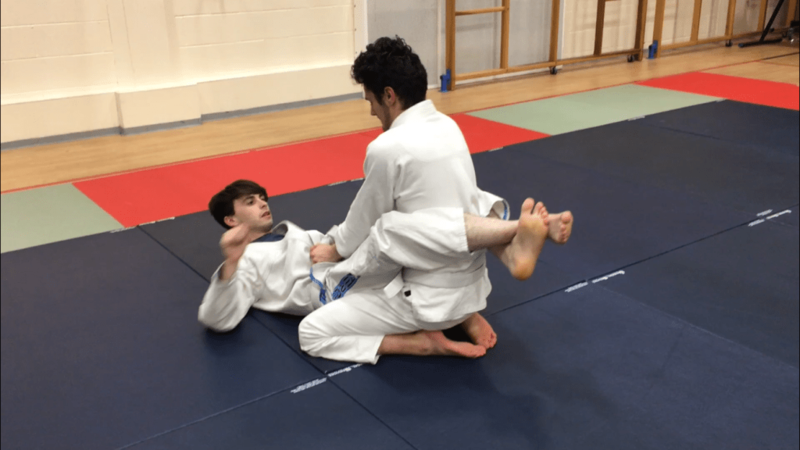 Remember to pay attention to learning and practising these small details covered below as Jiu-Jitsu is a martial art based on clever physical positioning in order to maximise the efficiency of our movements superior to that of our opponents. therefore the difference between good Jiu-Jitsu and bad Jiu-Jitsu is in properly learning and absorbing the correct technical details that enable this to happen. So lets learn how to pass the closed guard! Before we can start to break open and pass the closed guard we need to ensure that we have a strong immovable posture to work from, this will negate all of your opponents attacks and stop him from attempting submissions and sweeps which will throw you off attempting to pass as you then get caught up in having to defend them. With the correct technical details applied you will feel like an immovable concrete mountain and your opponents attempts of attacks will be brushed of with ease. 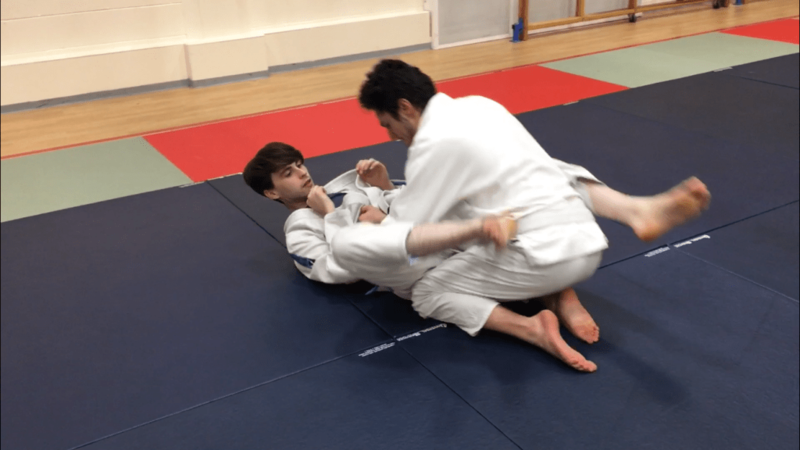 With a strong upright posture for everything above the waist and a low and wide base below the waist, the student is hard to grab and pull down due to being harder to reach around the collar (Gi BJJ) and Head (No Gi ). and harder to sweep due to having your centre of gravity so low to the ground and well supported with a wide shape to the knees, (harder to topple than something narrow). (1) Your upper body should be straight and upright, not leaning forward or back especially at the shoulders. 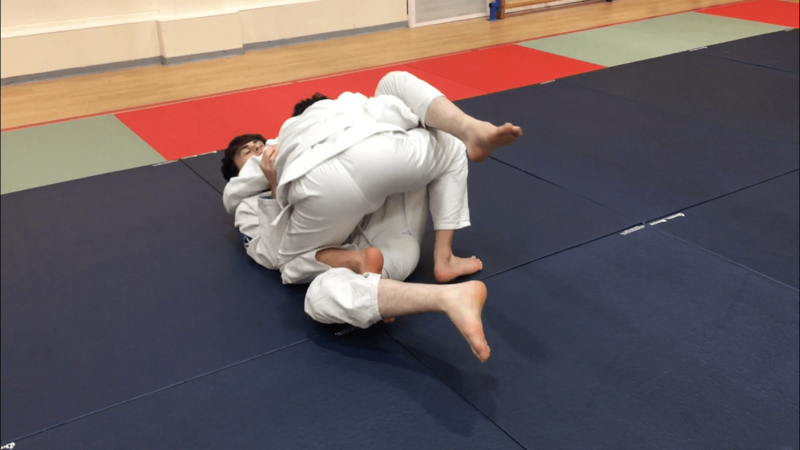 For Gi BJJ you want to either use a locked out straight front arm to utilise skeletal strength by routing the opponent’s force through the straight bone rather than a bent elbow joint which relys on muscle not to bend, this is a Gi BJJ detail as it needs to be secured to the two lapels (to prevent removal by the opponent, and with the hand no higher than the solar plexus (this stops our elbow coming too far forward and putting us in danger of ending up in an armbar) the second hand should be placed on the belt or trousers with elbow tucked inside the opponents thigh. For No Gi, place both hands one either side of your training partners ribcage and tuck your elbows inside his thighs. (4) (Important Game Changing Invisible Jiu Jitsu Detail) To reinforce all of this and lock it into place this next detail alone will make your posture feel like 10x the strength so pay attention: Your pelvis should be rotated upwards and engaged to lock the spine into place. this transfers the pressure when the opponent pulls his legs in away from the upper back and down towards the hips where it is easily negated. So now we have negated our opponents attacks and are able to keep him still and ourselves stable we can start to operate to break open the join of his two feet behind our back. (3) Stretching back and away while keeping opponent in place. (1) We now want to switch both our grips to our training partners belt or hip area and push down leaning forwards slightly with our weight and rising up with our hips now opening up the gap between our thighs and calf locking out our arms (skeletal strength) this will have effect of glueing our opponent’s hips to the mat and lightening our legs for movement. 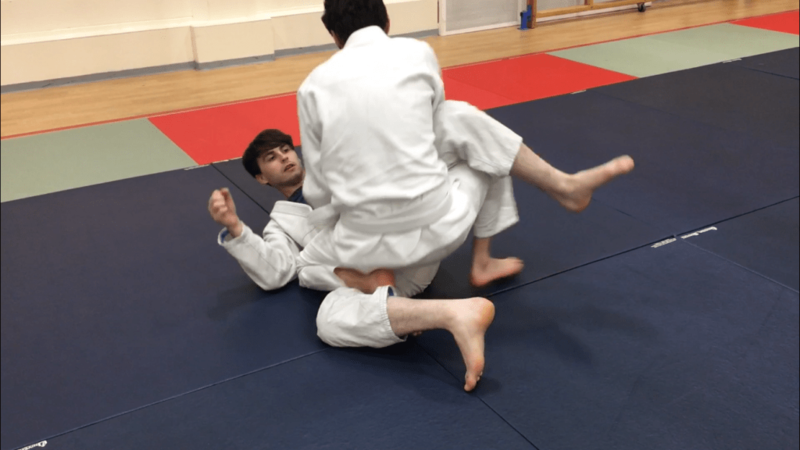 (2) This then allows us to slide our knee either in between our opponents legs placing it against his coccyx bone or against the back of his his nearside thigh. This is used as a wedge to keep him in place and stop him following us along the mat when we stretch back towards breaking the join of the feet next. 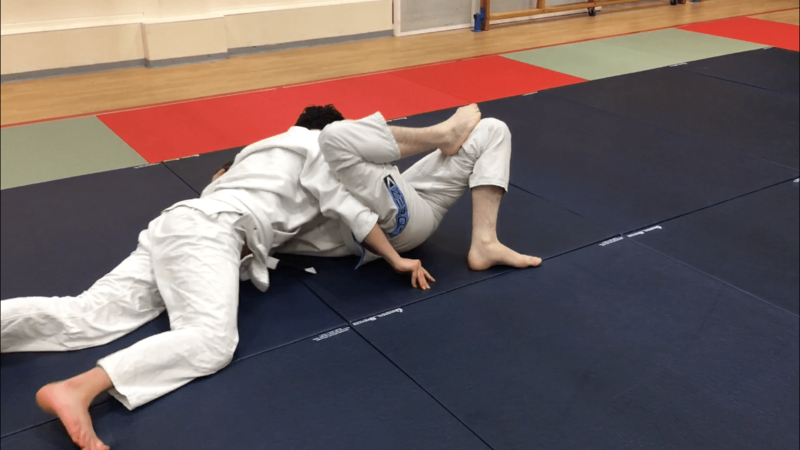 (Extra detail) Your opponent can try to stop this by riding his hips up and resting his backside and lower back on our knee, the technique will not work if this happens as his lower back and backside being on the mat is crucial to lcok him in place with the wedge. (3) Now we have our opponents hips effectively caged and wedged in place he cant follow us along the mat and we can start to stretch back. slide your non wedging knee backwards and out to a 45 degree angle while rounding your back and stretching back as far as it will go. This will often have the effect of breaking open your training partners guard right here. (4) For extra leverage you can also slide your arm on the same side as the knee which is sliding back (non wedge side), backwards and curl your fingers around the thigh and place your elbow just past the knee joint and push outwards and down. You can also step that leg up and backwards (away from any underhooks) allowing you to stretch even further back and also place even more leverage on the leg with your push breaking open the join by splitting it apart. Now that we have split the guard open, we need to wedge and lock this opening in place otherwise our opponent will just return to guard. 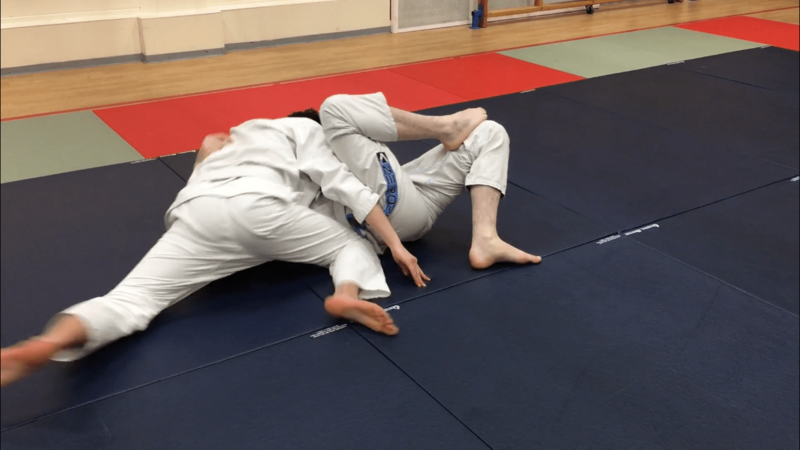 (1) As soon as the guard is split open we want to bring one of our knees up in between our opponents legs with the other down on the floor, this is known as combat base. 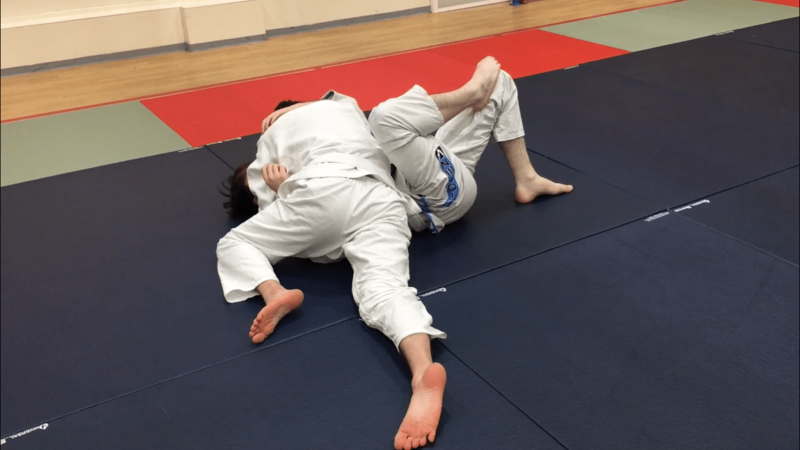 by doing this our shape is too wide in diameter for the guard to be rejoined, in cases where the opponents legs are long enough to do this the guard will still be much easier to reopen with the added pressure of a knee to push open. The leg should be straight from knee to toes and pushing outwards at a 45 degree angle with a straight driving force imposing pressure on our training partner and is reinforced by the arm acting as a wedge on the inside of it. By keeping our other knee on the floor we are able to maintain the low centre of gravity of our hips and still keep a well supported base. (2) Often this next step is attempted immediately upon opening to seize the momentum and thus the combat base becomes a fleeting transitional concept ( as in the video and photos in this tutorial). whether done immediately or after establishing the combat base. the next step is to push our opponents knee with our near side elbow or hand and slide our raised knee downwards over the opponents thigh to the ground pinning it with our shin and taking our toes off the mat for extra weight, for extra stability the knee can be pointed out at a 45 degree angle or for more imposing control for those confident in their stability can be pointed in at a 45 degree angle against the opponents body. Either way this step traps their leg to the mat. (3) At the same time as sliding the front knee forward over the thigh we want to raise our other knee up with our foot on the ground effectively switching our up down knee now and trapping the other leg between our upper thigh, arm and rib cage. this must be done at the same time as the sliding knee otherwise the opponent will block our pass with the knee shield. Now that we have wedged the guard open and have our opponents lower body under control we ned to continue our forward momentum and control the upper body and head while reinforcing our wedge on his legs, otherwise our opponent will start to use his arms to block our attempts and move his body to create space with which to free his legs and or attack. (1) Next we want to glue our opponents upper body and head to the mat by applying strong shoulder pressure onto their jaw (shoulder of justice) forcing them to look to look the other way this makes it hard for them to move and reduces their strength due to the head and legs being pushed in two different directions contorting the spine, at the same time reaching around their head with the same arm as the shoulder to lock it in place with our chest touching theirs. (2) at the same time reaching back with the other arm cupping around the knee to reinforce the wedge and keep the legs split open as far as possible. 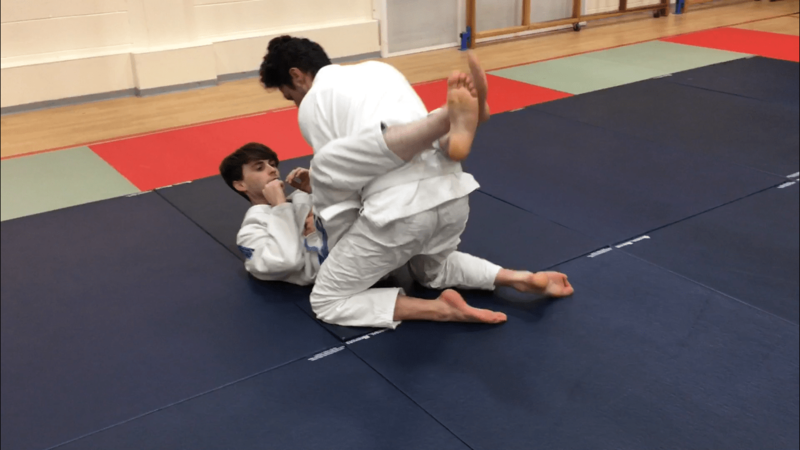 (3) We want to be applying a strong imposing forward pressure on both the head, body and legs to keep the training partner still and their guard wide open. its important the legs are stretched taught as any slack will give them better ability to move, which we want to take away. 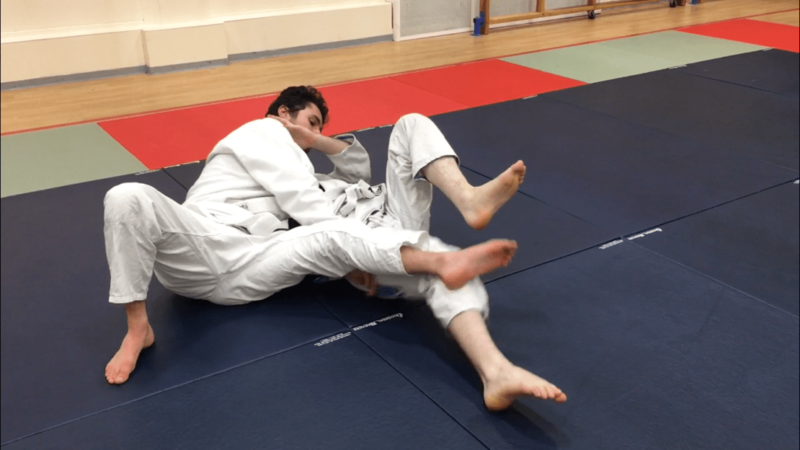 Now that the upper body is pinned and the leg wedge supported by the hand we can take a back step movement bringing one of our legs completely through our opponents guard without any danger of being put in the half guard. With the opponents legs securely fastened in place with your shin and hand and their upper body and shoulders pinned with your shoulder take a back step now removing your far side leg from the guard and bring it down onto the foot placing a (1) Solid upright post (this will stop the opponent rolling over on top of us as we can push back into them from this post and redirect their attempts to the ground. (2) The shin needs to remain pinned while doing this to prevent the opponent closing a half guard wit the bottom leg. (3) Your weight should remain engaged and driving into the opponents jaw and upper body while doing this not moving away from them. (4) Your arm needs to hold his other leg stretched taught still to prevent them from closing a half guard with the top leg. (5) You should land your hip on the floor or just hovering inches above it when doing the back step. having your hip too high can lighten the shin pressure and also make it easier for your opponent to slide their bottom leg around your waist and is not as stable not imposing, remember we want a low centre of gravity. Now that we have the first leg safely past the guard we can remove the second leg at the same time switching our arm wedge to the bottom hip/leg to prevent the leg from following us along the mat and /or attempting to slide the knee in the hip. 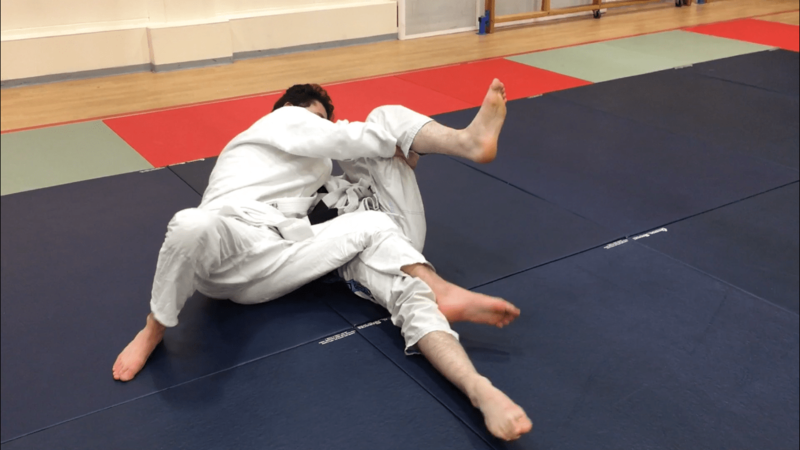 (1) We slide our shin pinning leg back and remove it from the guard, passing completely. (2) At the same time we block the bottom leg with our forearm and wrist with the hand curled around and under the hip and leg to stop it following us and attempting to recover guard. Now that both legs are free and the opponents hips/legs cant follow us, we can safely rotate downwards to side control to secure a pin and lower our hips preventing a return to our training partners guard. (2) Slide leg underneath post, turning hips down. (2) Keep their inside leg blocked with your arm. (4) Keeping your hips low, its important your newly freed leg goes underneath your posting leg and not the posting leg comes over the top as this will bring it to high and close to your opponents top leg as well as removing pressure from the opponents body. Now we have the opponent pinned in side control with our body and legs now safely away from the opponents guard and nice and low to prevent giving him any space we can either work from here or we can bring our knee in low reinforcing the arm around the leg and pushing the hips and legs away from us blocking them even further from a return to guard. (1) Slide the knee along the mat keeping it low to avoid taking weight off the opponent and pushing it into the hip and upper leg underneath your arm and pushing them away to the other side. you can see the training partners anti mount knee block below just waiting to slide across the belt line in the event of a gap. Now that we have reinforced our arm with our knee it is free to safely move and take an underhook on the far side to secure an over under seatbelt grip on our opponent. (1 The knee and body is low and safely blocking the leg and hips. (2) We can take our arm and slide it low over the opponents stomach, hand first, going under their armpit and up towards their head securing a tight underhook with our hand by their shoulder joining our arms, we can now optionally switch our head controlling arm to a deeper grip by hooking our middle finger into their armpit and pulling them in towards us and our shoulder of justice, placing our other hand underneath this one gripping it. (3) Hip angles down and away from legs making hip to hip contact. (3) Lowering hip down and angling body towards opponents head takes your legs away from them and gives you hip to hip contact with no gaps they can use to escape into. (6) Your knees and hips should not come up in the air for this movement, instead your legs should stay flat to the ground and your hips flat to your opponent. (7) You can now also optionally pull the opponents arm from the elbow up into your hip and trap it under your knee (not shown in photo). (8) (Invisible Jiu-Jitsu magic detail) You now want to push your toes into the mat and drive your weight into your opponent, bringing your legs an inch or so (but no more) off the mat so they are just hovering invisibly above the surface only our toes should be touching the mat and the next point of contact should be our hips to that of our training partners. this makes our pin feel 10x heavier as with the mat not receiving any of our weight from the toes up all of our weight is now placed into our training partner with no gaps available for him to use. This solidify’s our pin. 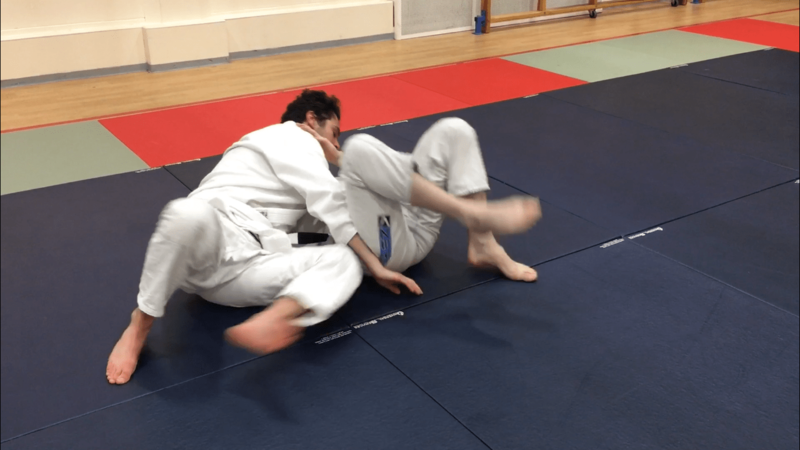 This completes our successful transition of breaking open and passing closed guard all the way into a secure side control. if we have now held our pin for 3 seconds we will be awarded our 3 points for passing the guard (BJJ competition) and we can now start ether progressing towards a submission or transition to another pin or series of pins from which to attempt submission of our training partner. To break open the guard we want to be driving them down at the hips into the mat so they cannot follow while keeping good upright posture and stretching backwards to break the join at the ankles. 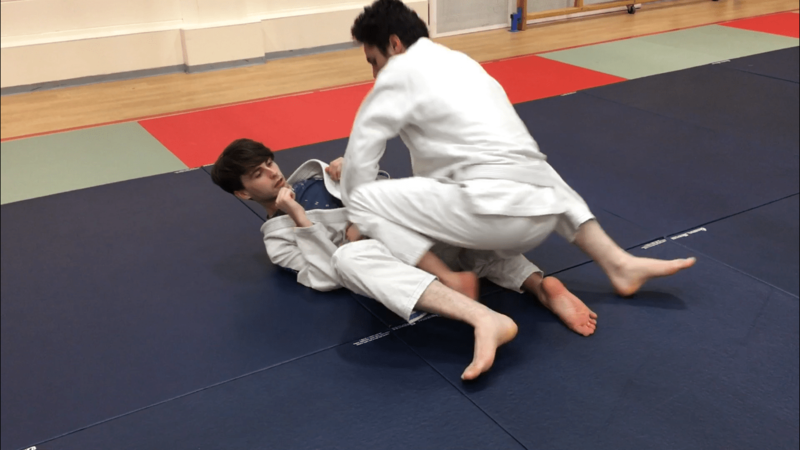 The invisible Jiu-Jitsu details shown above of engaging the hips to keep posture in the closed guard and raising the legs an inch off the mat in side control and similar variations will make a huge difference to your game in terms of making your posture stronger and your pins heavier. Hope this helps improve your closed guard passing and raises your overall knowledge of Brazilian Jiu-Jitsu. These technical details are one of my favourite things about the art and I’m looking forward to sharing much more of them with you in future! 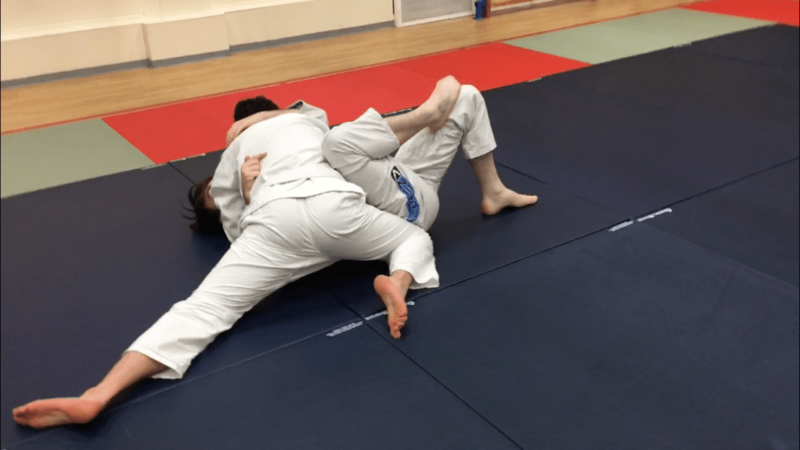 This entry was posted in Techniques by Adam Sparrow BJJ. Bookmark the permalink.